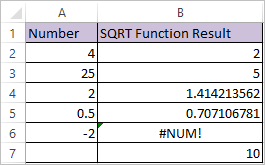 SQRT function in excel returns the square root of a number, when it is positive. SQRT Function returns an error if number is negative. number – Number to find the square root of. #NUM! Error occurs if the number has negative value.